Kendra Erhardt, 27, led an active life, spending time outdoors, practising yoga and kickboxing. Her friends and family are now rallying around her after a skiing accident in Jasper. She lost control and hit a tree. Lying in the snow on a black-diamond run, Edmonton skier Kendra Erhardt tried to figure out what had happened. "I couldn't move my legs, couldn't feel my legs," she said. "My one ski was, like, sticking straight up. For half a second I was, like, 'Oh, I broke my legs,' but then obviously that would have been so painful." Now paralyzed from the waist down, she faces a lengthy recovery but remains optimistic about her future. "It could have been so much worse," the 27-year-old said this week in an interview at the University of Alberta Hospital. "At least I didn't hit my head. I didn't have to deal with any of that kind of stuff. It was lower down the spine so … it's like, yeah, my lower body doesn't work but at least I still have all my upper body. Still have my brain. Erhardt and a group of friends were skiing on March 2 at Marmot Basin, near Jasper. She was near the back of the group when her accident happened. Down below, Trip Malapan finished his own run and met up with the rest of the group. Erhardt was nowhere to be seen. "Then all of a sudden I see everybody taking off their snowboard gear and running up the hill," Malapan said. "When we got there it didn't look like she was in good shape at all. She'll take a crash and usually get back up and be fine. But this time it seemed more serious." 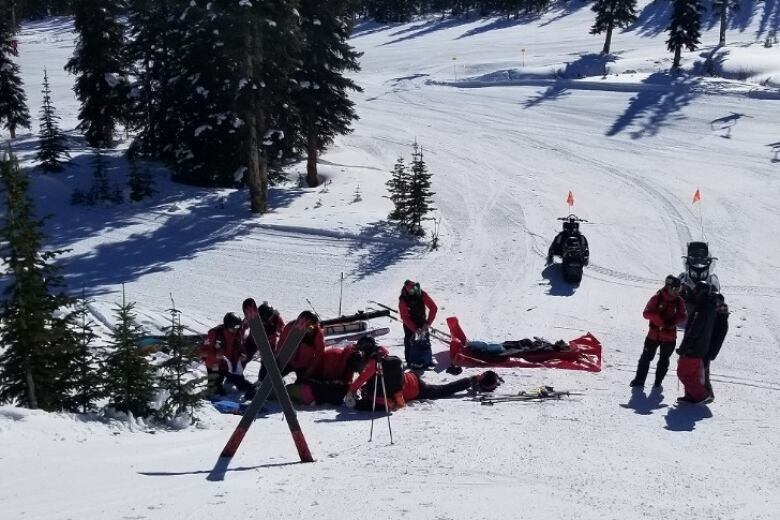 Ski patrollers got Erhardt off the mountain. She was initially transported to hospital in Hinton. Her friends drove to the hospital, where they learned Erhardt would be airlifted to Edmonton. "As soon as they came out and said they were airlifting her to Edmonton, [we knew]. It was really serious," Malapan said. Erhardt was flown to the U of A Hospital, where she was met by her parents. They learned her back was broken in two places and her spinal cord had been significantly damaged, causing paralysis from the waist down. She had also broken three ribs. Erhardt underwent surgery on March 5 and has been working on her recovery. She said she is ready for the challenges ahead. "I'm kind of taking it day by day for sure, but definitely the future will hold new challenges and new opportunities," she said. "We'll see how it goes." It's expected she will spend the next four to six weeks at the U of A Hospital before moving to the Glenrose Rehabilitation Hospital. There, she will undergo functional electrical stimulation (FES) — a treatment that can help people with spinal injuries, multiple sclerosis or brain injuries. FES enables muscles that have been paralyzed or partially paralyzed to move again. Her friends and family have started a GoFundMe fundraising effort. Donations will go toward the purchase of a wheelchair, an accessible vehicle, retrofitting Erhardt's home and other medical costs associated with her recovery. Erhardt didn't know at first that her friends had launched the fundraising campaign, which has already raised more than $50,000 of its $120,000 goal. "The first day, when it hit $15,000, I knew we might as well tell her," Malapan said. "When we told her, she automatically started tearing up. She was like, 'I didn't think a lot of people cared' and I was like, 'Yeah, Kendra, a lot of people care about you.' "
Erhardt had planned to be a geologist and hopes to be able to put her education to use. Before her injury, she taught kids to ski, instructed yoga and had recently discovered a passion for kickboxing. She said knows she'll need to make major adjustments in her life, but is trying to focus on the positives.